By Xah Lee. Date: 2016-06-18 . Last updated: 2017-02-04 . 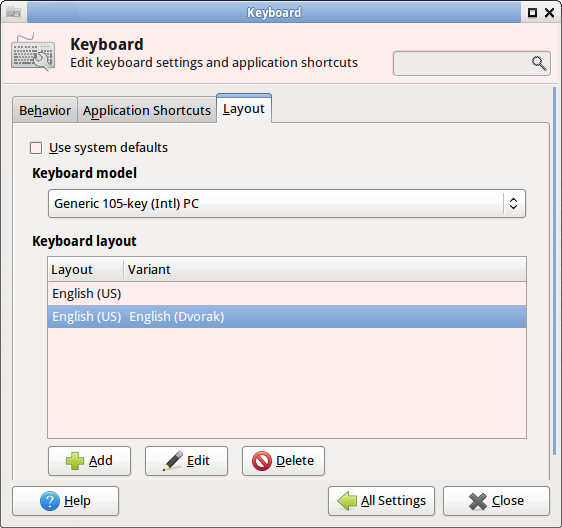 To switch keyboard layout in linux, the easiest way is using your desktop's control panel. In xfce, open the keyboard app in your control panel. Right-click on the newly added “Keyboard Layout handler” icon, and get a setting panel. Just follow the graphical user interface. You can also use command line. Here's command to see your settings. Here's command to switch to dvorak, but also using Alt+Space to toggle. setxkbmap -layout us,us -variant ,dvorak -option "lv3:rwin_switch,grp:alt_space_toggle"
Here's how to reset options.